In the classic film You’ve Got Mail, Joe Fox (Tom Hanks) tells his internet girlfriend/object of his emotional affair Kathleen Kelly (Meg Ryan) why men love quoting The Godfather. And while that may be true for most middle-aged straight white cis males, for everyone else, there’s the GIF of Mariah Carey responding to a question about Jennifer Lopez by saying, “I don’t know her,” smiling, and shaking her head. It is the response to everything in need of a response. It is peak celebrity shade, it is peak GIF, it is peak Mariah Carey, and—in a way—peak Jennifer Lopez. It is 15 years of American popular culture wrapped up in a single, perfect image. And she finally talked about it. Hyland: Your fans love to give you crazy presents. What’s something you’ve gotten recently from a Lamb? Well, there was a very interesting shirt that a fan made with a quote that I said years ago that, when I said it, I really wasn’t trying to be funny. I was just being honest and everybody’s kind of blowing it out of proportion but this guy had a shirt on and it was a picture of me that he made and the quote was underneath it — and I’m going to leave you hanging as to what it was. Hyland: Will I be able to Google what it was? 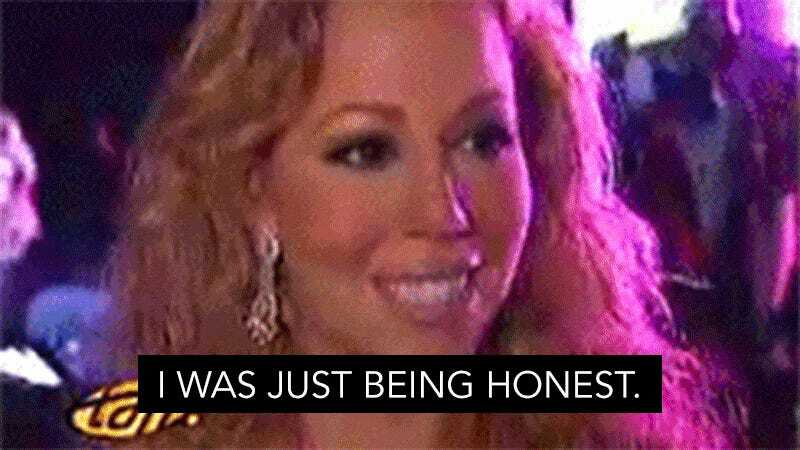 Mariah Carey yawned before telling a story about how she was “just being honest” when she said she didn’t know Jennifer Lopez. The mere thought of telling a story about Jennifer Lopez, whom she may or may not know by now, puts Mariah Carey to sleep. Be sure to give thanks for this interview on Thursday.